Yerba Mate plant, Ilex paraguariensis, is also known as:Paraguay Tea and Mate. The tea of the leaf is the beverage most consumed in South America. It is valued as a tonic tea, with no undesirable stimulant effects. Traditionally this drink is often sweetened with the leaves of Stevia, a native plant that grows in the same area as Mate. Approved by German Commission E as a remedy for fatigue. Very rich in essential vitamins and minerals. When cultivated it is keep pruned to to a compact bush to assist in the harvesting of the leaves. Yerba Mate plant is a native of Paraguay.and prefers rich, moist soils on (river banks) in a protected shaded position. Drought and frost tender. 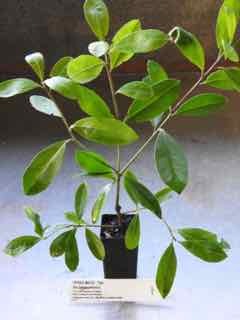 An evergreen shrub, growing to 6m x 4m.